Jan Murray sits alongside Rat Pack members Dean Martin, Sammy Davis Jr. and Frank Sinatra as the group unwinds backstage at Carnegie Hall after entertaining at a benefit performance in honor of Dr. Martin Luther King Jr. 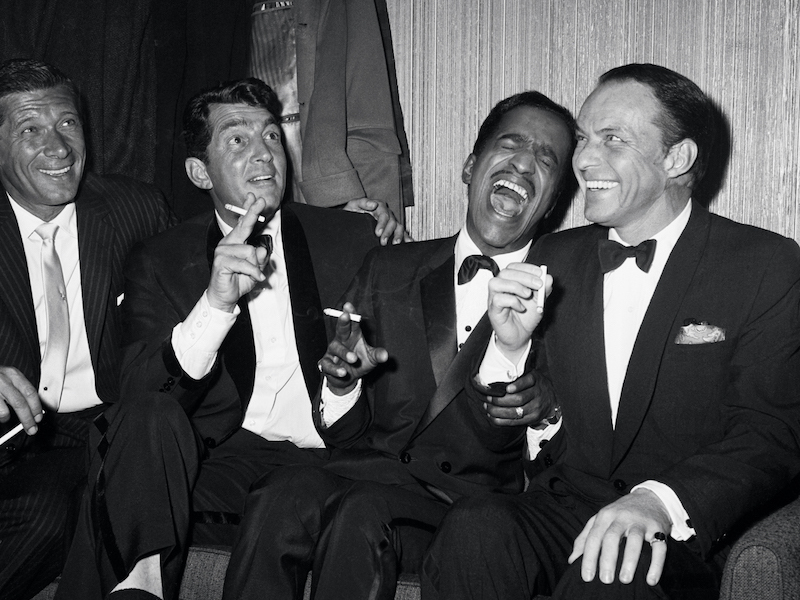 The Rat Pack was as much fun as the American male ever had. Perfectly timed at the turn of the fifties — when prosperity was overcoming the nation’s Protestant impulses, the second world war was fading from memory and Vietnam was still a far-off land — Frank Sinatra and his pals took hold of music, film, the stage and masculine aspirations by doing what looked very much like hanging out with their buddies. In this, they achieved much more than their own success, helping to establish the transformative new world of the sixties every bit as much as the rock ’n roll generation that came after them, expressing the thought that there might be more to life than work, family and duty. What’s more, in just a few action-packed years, they created a wealth of peerless entertainment, of myth and legend, story and rumour, and set a gold standard for cool that was to prove extraordinarily enduring. It began in another time and another world, that of Hollywood’s Golden Age. The original Rat Pack revolved around Humphrey Bogart, whose tough but sensitive image of manhood defined an era and was a strong influence on Sinatra and his disciples. At the start, Frank was a junior member, adopted by Bogart and his wife, Lauren Bacall, after he moved close to them in the Holmby Hills area of Los Angeles in 1949. They invited him into their circle, which included the likes of David Niven, Spencer Tracy, George Cukor, Cary Grant and Rex Harrison. One night, returning from a long drinking session, they collapsed at Bogart’s place. “You look like a goddamn rat pack,” Bacall rasped. Bogart and his friends ran with the idea, designing a coat of arms with a rat gnawing on a human hand and the motto ‘Never rat on a rat’. Their aims were simple, as Bogart told one journalist: “The relief of boredom and the perpetuation of independence.” Or, as Bacall had it, to “stay up late and get drunk”. The full article is available to read in Issue 50 of The Rake, available now. Subscribe here.